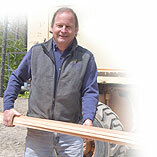 John started Steel Construction in the early 80s, after working up through the building trades. Since then the company has grown to include 10 full-time employees. John covers everything from the initial contact with owners and architects, through contracting and supervision of subcontractors and employees, to the delivery, service, and warranty of the projects.